There are no absolutes in dementia care. The dementia landscape is too variable to treat everyone who travels it the same. There is no way we could devise a one-size-fits-all framework that gives providers and caregivers a standardized approach to dementia care. A Gold Standard can’t exist where there is no economic unit, where there is no way to measure the intrinsic value of good will. What if there was a way to systematize delivery care models to ensure that the needs of dementia patients were being met from the ground up? What if we could leverage a decision tree, or flow chart, to ensure that we were supporting, facilitating, and supplementing for weaknesses at just the right time? What if we could hold ourselves accountable for checking off interventions each day, and be assured that the broad range of human needs- from the most basic to the most highly developed- had been provided to our resident or loved one? One such formula just might define the standard of optimal care. If only we could visualize this concept. Fortunately, it already exists. It was introduced to the world over 50 years ago by an American psychologist named Abraham Maslow. Maslow’s Hierarchy of Needs not only tells the story of our evolution as caregivers- how we’ve grown from the barbaric practice of warehousing the elderly to promoting independence and aging in place- it lays the foundation for the elusive Gold Standard of Dementia Care. He stressed the importance of focusing on the positive qualities in people, as opposed to treating them as a “bag of symptoms”. It’s almost like he was speaking directly to the Alzheimer’s caregiver, recognizing the stigmatizing devaluation of the dementia patient in our society. Maslow’s ideas are a fifty-year-old breath of fresh air. In Maslow’s Hierarchy of Needs, he presented a pyramid structure that layers the needs of humans in ascending order. In order for humans to develop correctly, the needs of each layer must be met. 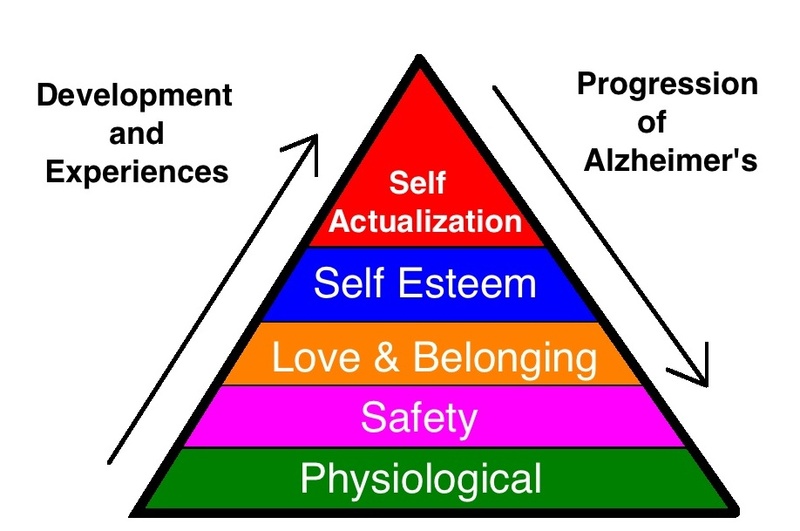 In Alzheimer’s disease, the loss of function follows Maslow’s developmental stages in reverse. It’s not to be used as a tool to measure regression, but as an instrument to guide caregivers in meeting all levels of needs. Physiological: The physical requirements for human survival: eating, drinking, excreting, and breathing. This is old school institutionalization. As a society, we figured this one out long ago. Gold Standard: Provide assistance with these tasks in a manner that maintains the honor and dignity of the person. Promoting independence and participation is key. Safety: Safety and security needs include personal security, financial security, health and well-being. Provide a safety net against accidents and illness. Gold Standard: This is where prevention and protection come into play. Prevent falls, prevent elopement, prevent skin breakdown, prevent contractures, prevent aspiration, prevent loss of function. Protect finances, protect relationships, protect health, protect from danger. Love and Belonging: Friendship, intimacy, family… humans need to love and be loved. Even Maslow recognized that deficiencies within this level of due to hospitalization, neglect, and shunning impact the individual’s ability to form and maintain emotionally significant relationships. Isolation, depression, anxiety- the companions of Alzheimer’s- fill the spaces where love should live. Gold Standard: Provide two opportunities several times a day; the opportunity to express love and the opportunity to feel loved. Hugs and firm touches on large body parts help affirm loving sentiments. Nurturing activities like pet care and doll rocking also provide opportunities to love. Even on the most discouraging of days, the love of family and friends must shine through. Esteem: This is the level where we feel valued and appreciated. This is where we not only need to feel respected by others; we also garner our sense of self-respect, self-confidence, and self-esteem. This is the level where we transition from external value to a valued sense of self. Interesting that people who are losing their memories and cognitive functions cling to this sense of self by repeating their personal stories over and over. It’s like they are asking you to carry their esteem in your pocket. 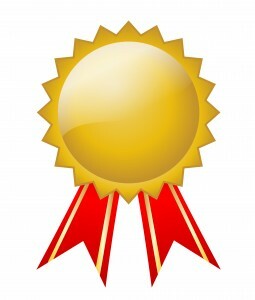 Gold Standard: Validation is king. Good old-fashioned manners hold a lot of weight as well. If you want someone to feel appreciated and respected, make eye contact, wait for a response, always affirm, be patient… and allow opportunities for the person to be productive and useful. Therapeutic chores are so much more meaningful than a classic movie. Ask their advice on a subject, preferably on a topic that’s right in their wheelhouse. And be oh-so-thankful for the response you get. Simple compliments don’t necessarily translate into increased self-esteem. Feeling valuable and useful does. Self-actualization: Maslow believed that in order to achieve self-actualization, all previous levels must be mastered. This pinnacle of human development is where potential lies. It is where the desire to fulfill your destiny and be all you can be is found. In Alzheimer’s disease, it is also the first thing to go. Gold Standard: Because self-actualization is fragile and fleeting even in healthy minds, it must be sought with dedicated intent. It may only be a brief moment, a flash of insight that widens the eyes in understanding. It is helping them achieve a goal, reclaim a lost function, fight through the fog and have a good laugh. Self-actualization means recognizing themselves in roles, responsibilities, conversations, situations, and even within their own skin. It’s finding that potential, that portion of the brain that still functions, and pushing it toward success. The Gold Standard of Dementia Care is quite simple: provide care that targets each level of need on a daily basis. There must be an intentional effort from the caregiver, with less reliance on passive, ambient experiences to provide value and meaning. However, intentional effort need not translate to increased effort. The beauty of this formula is that multiple needs can be met during a single experience, and the greater awareness of each target item, the easier this archetype is to navigate. Wow – that was very enlightening. You were able to take something that is very complex and put into an easy to understand “formula” that caregivers can understand. Awesome information! I will certainly apply in my caregiver’s support group! I think that’s spot on, I would just like to add the word you used earlier stress, obviously in a different concept but never the less hugely important. How can we gauge success of dementia support when we can’t measure the stress on the individual. Maybe I’m playing devil’s advocate in respect to this. A voice from the UK . All the words you use to describe this as a potential gold standard approach are person centred and inspiring. I like the approach and the suggested practical ways of delivering good care. But the arrow pointing downwards alongside Maslow’s triangle and your sweeping statement that “In Alzheimer’s disease, the loss of function follows Maslow’s developmental stages in reverse” is offensive to me and to a colleague of mine who has a diagnosis of Alzheimers disease – she showed it to me yesterday and we are both shocked! I am an experienced practitioner ( occupational therapist) and writer myself in the field of dementia care. The diagram implies that the person with Alzheimers deteriorates to a position where only physiological needs remain. I am hoping that this is not what you intended ?? My colleague plans to use this diagram in a presentation she is giving soon as an example of the negative attitude that still prevails towards people living with Alzheimers. As I say, she has Alzheimers disease herself, she is a retired doctor and the presentation is about honouring end of life wishes for people with dementia. Hazel, I thank you for your comment. I have re-read my post and am trying to see your perspective on my words. If you have read my blog, you must know that I am a champion for the rights and dignity of persons with Alzheimer’s disease. My intention would never be to perpetuate a negative attitude toward anyone suffering from Alzheimer’s. The “sweeping statement” is followed by another statement that says, “It’s not to be used as a tool to measure regression, but as an instrument to guide caregivers in meeting all levels of needs.” Never in my wildest dreams did I think that this was a harmful statement and I am so troubled by that possibility. The purpose of the diagram was for caregivers to see where they might need to intervene as the disease progresses. I am sorry if I have offended anyone with the disease. In fact, I have often wondered how difficult it must be for people with the disease to read about what lengths their caregivers may have to go to in order to provide care. Many times I have had to choose which audience I am addressing for a specific topic: I want to be realistic and helpful for the caregiver, yet hopeful and encouraging for the person with Alzheimer’s. Sometimes I cannot do both at the same time. I too have a friend, a retired physician, with Alzheimer’s disease. Sometimes I consult with him for his perspective on my posts. I try to be sensitive to the subject matter and it’s influence on my readers’ feelings and actions. I’m sorry if I got it wrong this time. At any rate, I am glad to know there is another OT and writer out there who is trying to bring awareness and education to the dementia community. I hope you know that I am on your side. And your colleague’s presentation sounds wonderful. Please let her know I would love learn what she has to share.